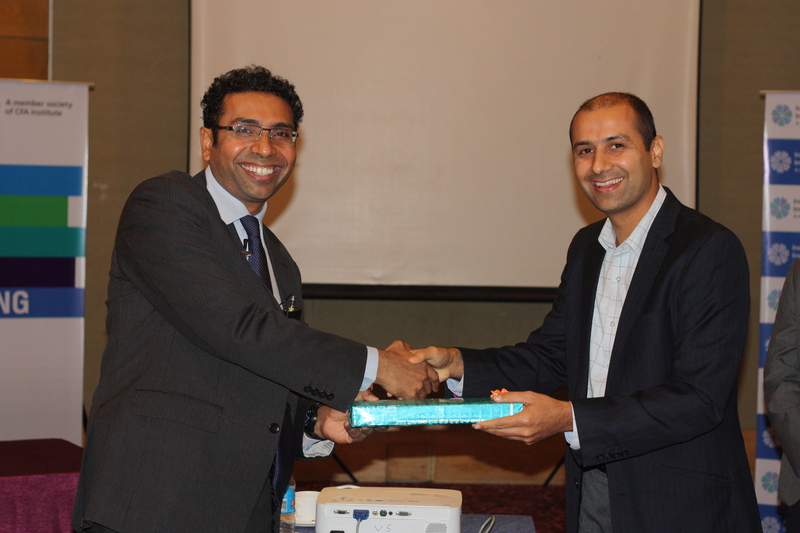 The IAIP Bengaluru Chapter organized an engaging speaker event presided over by noted research analyst Saurabh Mukherjea, CEO – Institutional Equities, Ambit Capital. Saurabh is also the author of the book – ‘Gurus of Chaos: Modern India’s Money Masters’ released in October 2014. During the event, the speaker shared some of his insights gained through compiling his book and his perspectives about the Indian investment scenario. Saurabh highlighted the key challenges that have restricted the development of financial market in India such as low financial savings of about 10.0 percent of the country’s GDP (although savings as a percentage of GDP is among the highest in the world as most Indians invest their savings in physical assets such as gold and real estate), high costs of capital for companies (around 15.0 percent for mid-sized companies and greater than 18.0 percent for smaller establishments) and poor corporate governance practices followed by companies in general. Saurabh expressed his disappointment in the general acceptance of bending rules to benefit a few, a mentality that has long prevailed in India. Ensure that a company’s financial statements are authentic: The reliability of the financial statements is to be verified by reviewing details with the company’s other stakeholders. (For example, one may understand through discussions with the company’s distributors whether the company is trying to channel stuff its inventory to inflate sales). Overcome inherent psychological biases during investment decision making: Traits that help an investor to overcome his biases include Contrarianism (detachment but not disinterest) and Humility (eagerness to learn). The event concluded with an energetic Q&A session. In response to a question about how to effectively assess financial statements to identify underperformers, Saurabh noted that he focuses on the flow of financial information from the Income statement to the Balance Sheet and finally to the company’s re-investment rate to evaluate the financial health of a company. Further, he opined that the implementation of International Financial Reporting Standards (IFRS) w.e.f April 2016 for listed companies could drive improvements in the quality of financial statements through robust accounting policies such as the ones for revenue recognition, the marking-to-market of financial hedges and stringent guidelines on the writing-off of goodwill on acquired companies. To a question on his prediction of the stock markets in the upcoming years, Saurabh elaborated that the Indian Stock Markets typically move in cycles and that investors could expect healthy returns from their equity investments over the next 2 years. He also believes that investment professionals will have a bright future in the country for the next few years given that the financial markets are expected to deepen, creating numerous opportunities for people in the industry including CFA charter holders. This entry was posted in Bengaluru, Events, Speaker Events and tagged Abhimanyu JL, Ambit Capital, CFA, Gurus of Chaos: Modern India’s Money Masters, Saurabh Mukherjea CFA, Srinivasa Sharan. Bookmark the permalink.